Many homeowners face some degree of water damage in their basement. The location of the basement and its structure leaves it susceptible for water damage and it’s important to know the symptoms to look out for. 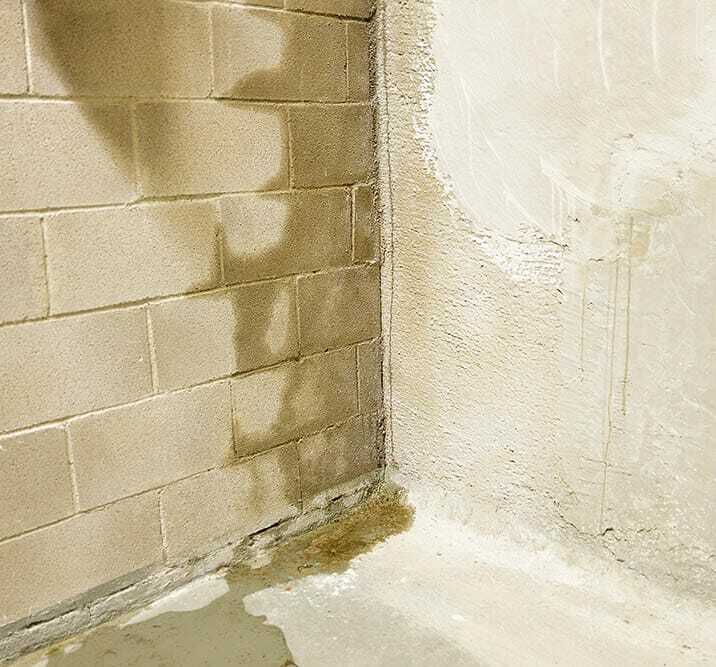 Our waterproofing experts at Total Foundation Solutions can quickly pinpoint the symptoms of water in your basement and provide a recommendation on how to protect your basement from water damage. As a homeowner, it’s important for you to know how to identify these symptoms and when to call in a professional. How Does Water Get into a Basement? There are some obvious ways that water can enter your basement, as well as some not-so-obvious ways that can be hard for a homeowner to pinpoint. If you notice any sign of water in your basement, it’s best to call in a professional right away to find the problem and implement a solution before it gets worse. If you have concrete floors in your basement, water can seep through even the tiniest of cracks. As the soils in the ground get saturated with water, the water can push through cracks in your basement floor and cause water damage. Water can also easily seep through any wall cracks in your basement. As hydrostatic pressure builds up in the soils that surround your basement walls, it can put a lot of pressure on your walls and cause any groundwater to enter your basement. Plumbing failure is a common cause for basement flooding. Plumbing flood can come from issues with washing machine hoses, water heaters, or leaky pipes. To avoid plumbing flood issues, it’s best to check these items regularly for any damage or need for repair before they lead to a basement flood. If there are any gaps in your window units or window wells, this is an easy place for outside water to enter your basement. A clear sign of this issue is water around your windows that may be running down your basement walls. Unfortunately, water in your basement is more than just a wet mess to clean up. If left untreated, water can lead to extensive damage that can impact the rest of your home. If you notice even the subtlest sign of water in your basement, it’s best to get it checked out immediately to prevent the problem from getting worse. If you’re worried about water in your basement, you can always call our team at Total Foundation Solutions to come inspect the problem. For your own peace of mind, it’s beneficial to have some basic knowledge of what to look out for to protect your home. Any flooding or pooling of water on the ground is an obvious sign of basement water damage, but it’s not always easy to tell what’s causing the problem. Whether big or small, if you notice any sign of basement flooding it’s best to call in a professional right away. Any untreated water damage in your basement puts you at risk for mold growth. Mold can quickly grow in moist environments and cause extensive, and even dangerous, damage. Certain molds can be extremely dangerous for your health and impact the air you breathe every day in your home. Untreated water damage can also result in musty odors. The stack effect can cause these musty odors to push through your basement and infiltrate the main living areas in your home. If you notice any musty odors in your basement or your home, this could be a symptom of basement water damage. Our waterproofing experts have had extensive training in basement waterproofing and can quickly pinpoint the symptoms and provide a recommendation on how to fix the problem. For over 30 years, we have helped protect homes across Northwestern Pennsylvania and Western New York from water damage with our waterproofing solutions. Contact us today for your free basement waterproofing estimate! Whatever your foundation problems, Total Foundation Solutions stays true to our name. We are proud to provide homeowners in Edinboro, Erie, Warren and surrounding areas with foundation wall repair, piers for settling foundation and much more. If your walls are bowing or cracking, or you suspect your Pennsylvania and New York home may have foundation problems, don't hesitate to call today for a free no obligation estimate. Total Foundation Solutions looks forward to hearing from you! © 2019 Total Foundation Solutions. All Rights Reserved.